The Flail Whip is the second whip damage upgrade in La-Mulana 2 — the first is the chain whip, located in the Immortal Battlefield. The Flail Whip is even more powerful, and you’ll find it without too much trouble. The real trick is unlocking the path to reach it. To do that, you’ll need to get all four sigils. There are five sigils, but the last sigil cannot be obtained through normal means, and it isn’t required for the Flail Whip — so we’re just going to focus on the sigil locations, and the flail whip. For every sigil you locate, you’ll be able to break the corresponding sigil tablets. You’ll need these to make progress, and the trickiest sigil of all is the final Death Sigil. Keep scrolling for all the details. To get the Flail Whip upgrade, you’ll first need to get four sigils — the Origin Sigil, the Birth Sigil, the Life Sigil, and the Death Sigil. Once you unlock a sigil, you’ll be able to destroy sigils with the matching symbol. The Flail Whip is the second damage upgrade to the whip, your standard weapon, so it’s one of the most valuable treasures in the ruins. You won’t be able to unlock it until fairly late in the game. Required Items: Feather (Double-Jump) and Gale Fibula (Sprint) — And others, just to reach Valhalla and collect all the sigils. Where To Find The Flail Whip: Valhalla – Located near the Blood Corridor door, in the room with the statue holding all four sigils — Origin, Birth, Life, and Death. Break all four sigils, and the Flail Whip will appear. Before you can do that, you’ll actually need to get all four sigils. The Death sigil is the hardest to locate, but we’ll list all four below incase you missed one. Origin Sigil Location: Divine Fortress – Defeat the Hugin and Nunin sub-boss. You can’t miss it. Birth Sigil Location: Shrine of the Frost Giants – Found under the room with the thick white snow, to the right. Place all seven weights on the switches to make the ceiling break. Then drop through the ceiling to fall through the snow. Unlock the chest after breaking through the thick snow — you can only get through if you fall in from a good height. Life Sigil Location: Icefire Treetop – In the top-left corner of the map. Find a chest with a “Birth” Sigil in the room. Break the Birth Sigil to unlock the chest. Death Sigil Location: Underworld (Doom) – Defeat the Ajisukitakahikone sub-boss. To access the Underworld, you’ll need to use the one-way entrance through the Blood Corridor. 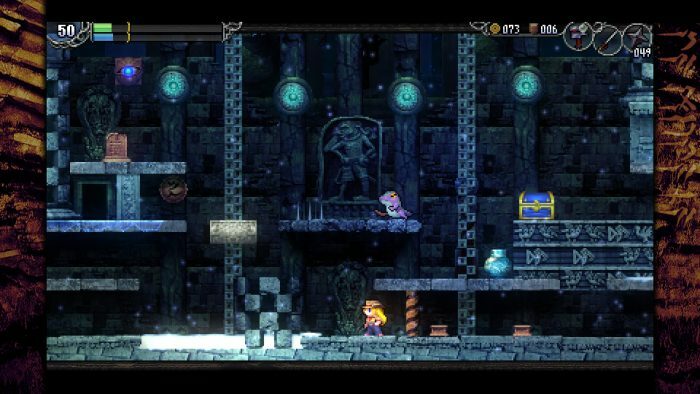 To reach the sub-boss, you’ll need to collect the Bronze Mirror in the Guidance Gate, in the original La-Mulana Ruins. To defeat the sub-boss, use the Mjolnir. You’ll die if you use anything else. After defeating the boss, destroy the Life Sigil to unlock the chest.